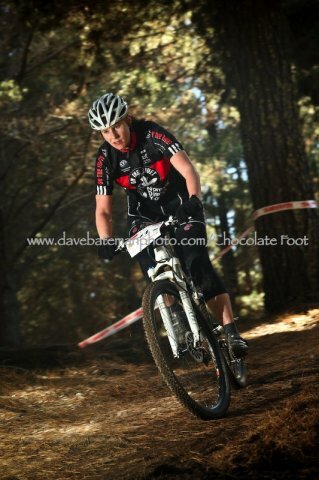 The Rydal STM Chocolate Foot round was a bit of a fail race for me. A combination of a very bad night’s sleep, a crazy twitching eye, riding my 26er for the first time in six months, leaking shocks… the list continues but mainly I just felt absolutely dead. I think on my third lap I was overtaken by the last person on the course and then proceeded to get lapped by the fast boys. I pulled over and nearly burst into tears when I saw Gumby standing on the side of the track holding out a pretty little posy of flowers for me. I knew my race was finished so I rolled back to the start after three laps and called it a day. But oh what a day it turned out to be! I came to the realisation yesterday that I have actually had very little involvement in the buzz of activity that happens back at the event center. I thought I could put myself to good use helping out Sebria who were smashing out laps at the top of the mixed pairs category. Seb was back in form after a back injury put him out of action for the Welby round and the prettier half (Ria) was also relaxed and spritely as ever following a few easy weeks where the wedding had utmost priority! Being perfectly positioned next to the Muc-Off station and having super-support-crew Pete looking after them, Sebria were going great guns! So, feeling rather superfluous I ventured out into the showground to get amongst the hype. I visited nearly all the event sponsors and this is definitely a not-so-subtle plug for them! After a much needed cappuccino from Longpoint Coffee I grabbed a seat and watched the youngsters (and Al on his unicycle) battle it out in the kiddies race. It was still surprising chilly and within 30 mins I was back for a second coffee and a sausage from the Rydal Showground Committee BBQ. Cofffeeeeee!!!! By 11am my eyes were wide open and I was bouncing around in a happy place at last. Casually talking to a friend Marty who had also semi pulled the pin, our ears pricked up when we heard the announcement that the wine tasting was officially now open. What the heck! We weren’t racing anymore and it was past midday! We headed over to meet the James Estate crew and taste some of their produce. After a good mouthful of all varieties I settled on the James Estate Petit Verdot which will go down a treat with some fine red meat next weekend. The brochure aerial shots of the vineyards revealed their proximity to Wollemi National Park, and apparently Jimmy Jack (AKA Graeme) has made an awesome network of mountain bike trails to suit a wide range of skill levels. We will definitely have to drop by on our next visit to the Hunter Valley! Right next to the wine tasting was the Mountain Biking Australia tent where I grabbed myself a free magazine and went to read it the sunshine while watching Gumby get clobbered with tyres as part of Kenda quoits. Hehe. Next, I headed over to the Body Mechanic where I met Blair. I explained the niggly shoulder issues and he soon had me on the table and massaging out the tight spots. He explained how the guys at the practice all participate in running, cycling and multi-sport events and are very familiar with typical cycling injuries. He even gave me some tips on how to help activate the shoulder before events like this one. Magic! As the day was drawing to a close, the solo riders were coming through looking dustier and dustier. Fellow On the Rivet rider Ed was having a cracker of a race and seemed to have pulled a good gap on Andy Hall, riding off the front to take the win. Sebria were on fire and Ria was pulling out some amazing lap times – “riding like a demon” was the saying of the day. I was trying hard not to gloat to increasingly exhausted Seb about coffees, wine and feeling a million dollars (nearly) after a rub down. I popped his bike over to SRAM / Shimano neutral support and then sent him out for one of the last few laps. Unfortunately a very unlucky flat in the second last lap pushed them back to finish in second place after leading for nearly the whole day. It was still a brilliant result and it was great to be a part of supporting such a ripper team! Congrats! While it was disappointing to have traveled such a long way to only race for two hours, I was super impressed with the non-racing side of the setup the Chocolate Foot crew put together. After a day of what felt like pure indulgence compared to racing for eight dusty hours, I have to say thanks to all for a great day of entertainment. Plus, I have to admit that that will probably be the easiest fourth place I’ll ever get away with! 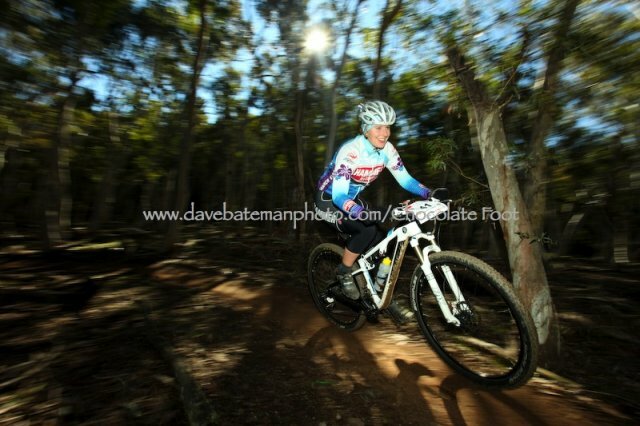 This entry was posted in BikingBethany and tagged Chocolate Foot Singletrack Mind, races on October 29, 2012 by bethany. Writing this post from bed with a sore throat, snotty nose and doped up on an interesting combination of lactic acid, ibuprofen and lemon tea, I must admit I sometimes wonder why we do this to ourselves! I don’t think I have it in me to write a witty or detailed race report, but instead I thought I could share some of my more lighthearted observations in the hope that you might take note and get to the finish line in more reasonable shape than I was. * Getting good sleep the night before a race is crucial. Don’t be stingy and jam five people into a three bed motel room on the side of a noisy highway, offering to sleep on the floor to make it cheaper. * If you wake up with a sore throat and head cold, maybe racing is not the best idea. * When it is hot, you must still eat! 2.5 Hammer bars, 2 gels and a fruit rollup would not even be enough to get you through a day at the office, let alone racing your bike for eight hours. Find something you can get down quickly, wash it down with some water. Do not roll around lap after lap giving the marshals something to laugh at when you are unsuccessfully force-feeding yourself to the point of gagging. * If things are getting hectic, have a ‘breather lap’. Take your foot off the accelerator and just re-group for a while. First, concentrate on breathing. Second, accept pain as it is. Don’t think about it getting any better (it won’t), just embrace where you are. * If you start hugging trees like you are a koala, take a breather lap. And I can tell you that even when you are a delirious koala, trees still hurt when you throw yourself at them. * When you are arguing with yourself in third person, it might be best to do it in your head. People give you very strange looks when you argue with yourself for being too cautious and walking over rock drops. * If someone yells ‘RIDER’…. answering in a high pitched angry Pokey voice ‘OK Gumby, just a minute it’s not safe here’ might also get you yelled at. * Smile, otherwise, why are you here? Part way through the race a lady told me to smile. I grunted at her. Then I felt bad. The next lap I gave her a big smile and thumbs up and it kept me on a high for at least another 10 minutes. Kinda smiling, OK not really. Photo courtesy of The Seb. * Do take the extra one minute to get your chain lubed mid-race. It is amazing how happy it can make both you and your bike feel. * Electrolytes are your friend. For a change I never once had the inkling of a cramp, even in the hot weather. I was taking a small bottle each lap which had a Hammer electrolyte fizz tablet. This seemed to work very well. * Have a good support crew and don’t yell at them! If you are nice they might even baby-wipe down your filthy self and drive you home. * When Gumby offers to race you up the hill, I am not sure what the answer is. I tried and it hurt, but I would have felt a bit rude not to. A very tough course, made even tougher by feeling decidedly average to start with. Big thanks to Merryl who made me fight tooth and nail for that podium while being the most encouraging person out on track. Also thanks to my amazing support crew The Seb and to all those cheering us on from our pit stop, you guys definitely got me through this one. Tired and happy. Photo courtesy of The Seb. 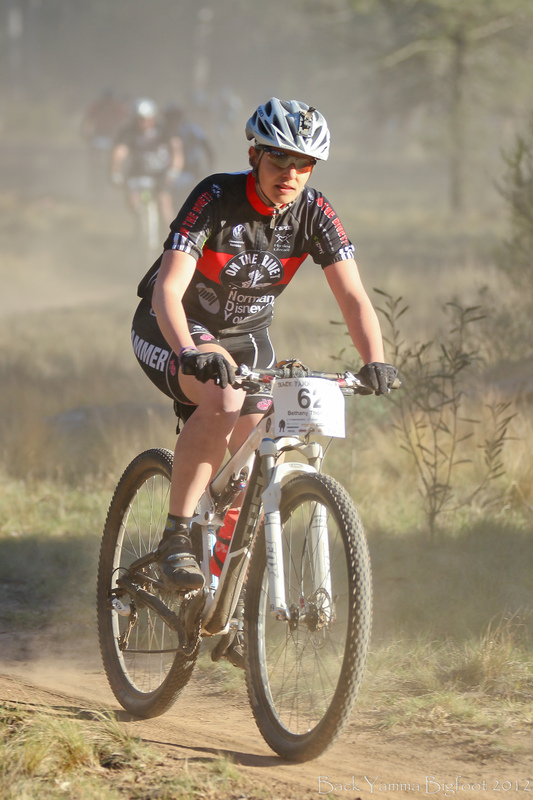 This entry was posted in BikingBethany and tagged Chocolate Foot Singletrack Mind, races on September 17, 2012 by bethany. 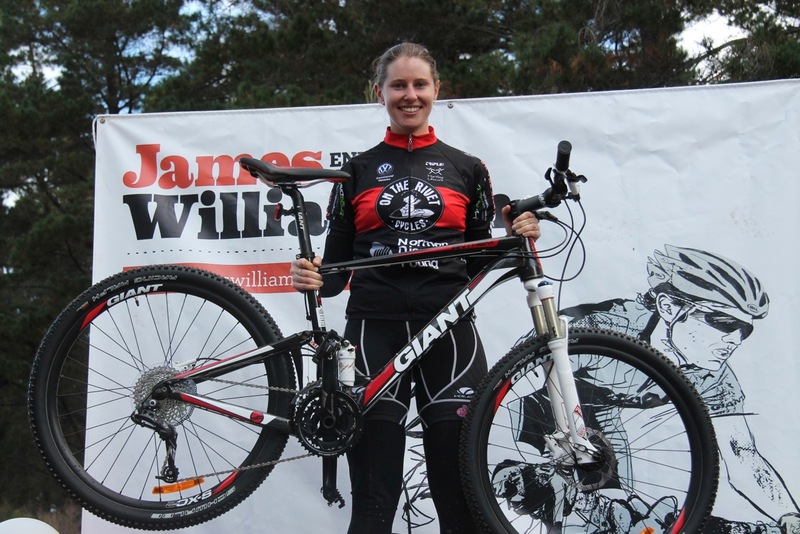 Firstly, a wrap-up of the the very fun Chocolate Foot SRAM Singletrack Mind Round 3 and then the hilarity that unfolded when riding home from the event to Canberra on Monday and Tuesday, bikepacking style! 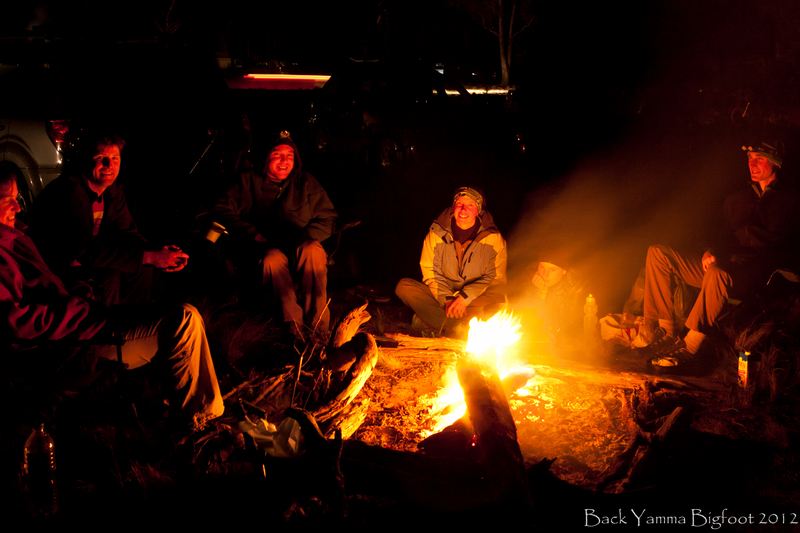 After a fantastic night of good food, a well stoked fire and great company in Vincentia, we headed up to Coondoo Rd in Nowra for round three of the series. I was a bit apprehensive of how things would turn out after test riding the course on Saturday and finding myself having one of those awkward days where nothing felt right. Having settled on taking the B lines and walking most logs, I was not feeling too elated to be racing the course for the next seven hours. So as not to get in people’s way, I started towards the back and we rolled out. Turns out the course was AWESOME and all I needed was some speed to launch over those logs! Being at the back turned out to be a bugger and was much slower than I would have liked. At one point I knew Liz was right behind me and thought if she passed I would hug that wheel like there was no tomorrow. Unfortunately being less technically inclined, my B line options were no match and she snuck past and off into the distance in the long grassy section. I also never saw Janet, just as in race 1 and 2, until she was standing on the podium. She must start at the front with the big boys. Out on the track I felt comfortable and in control of exhaustion and nutrition (well as much as one can be when racing for 7 hours) and this shows looking back at lap times which were fairly consistent. However, about halfway through the race my bike was getting squeakier and squeakier. I tried moving pedals around a bit and settled on the fact that it was dusty and I hadn’t stopped for any lube at all. At the top of the switchbacks near the dam I happened to look down and boy did I get a shock to see one of the screws on the rear suspension 99% hanging out. I stopped immediately and when I touched it, the screw came out completely. Without a torque key I was buggered and nobody had one until good Samaritan Ed MacDonald rolled past. The torque key did the trick and I was off and riding laps as before but now with a sense of urgency to catch back up. Unfortunately Ed lost second place by about 30 seconds and I can’t help feeling partly responsible for that! I also lost third place by about 30 seconds. Stupid mechanical! 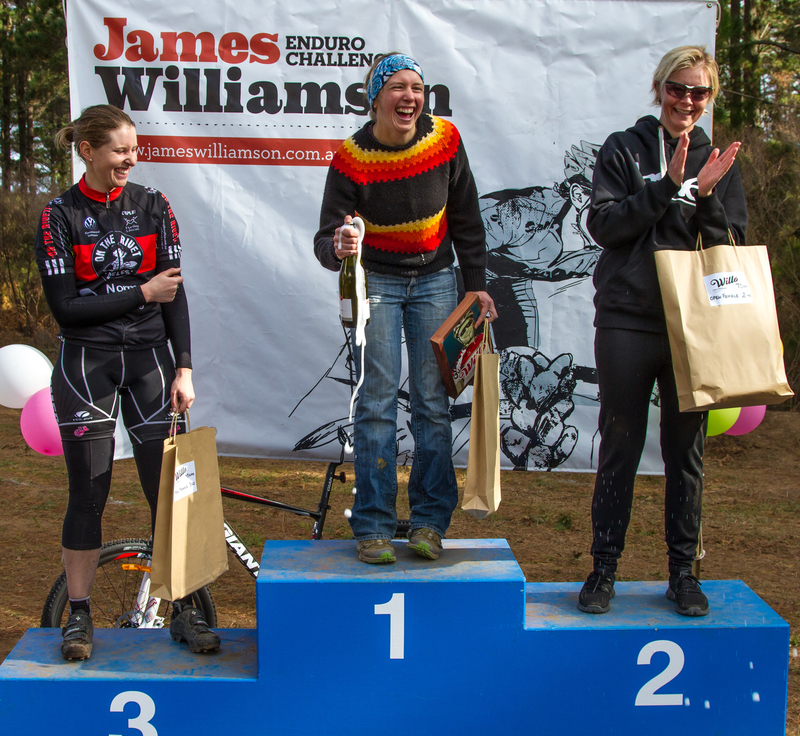 I didn’t get any photos of the event itself even though I had specifically put a camera in my transition bag. I thought of it numerous times around the course, but then forgot every time I got back to transition. I sifted through the 300 odd Dave Bateman photos but somehow I didn’t make a single appearance – must have been going way too fast for Dave’s shutter! All in all it was a super fun race. Big thanks again to Chocolate Foot for putting on yet another great event. Looking serious. A late addition photo from Dave Bateman. Now what most people do after an enduro race is pack up, drive home, eat so much bad food that your stomach hurts, shower and sleep well in a comfy warm bed. This is sensible and what I have always considered typical post-race behaviour. What Al Usher and I did, however, was a tad different! As the event center was emptying out and the sun was setting, Al and I were making camp. Collecting wood, setting up our bivys and converting our bikes from tired enduro racing bikes to bikepacking machines! Since the last trip I have acquired a Revelate Designs ‘Sweet Roll’ which means I can now accommodate all my sleeping kit on the handlebars. For this trip this consisted of a lightweight bivy (thanks Jarrad! ), sleeping bag, sleeping bag liner and a Thermarest. Al’s bike didn’t have any bag attachments as he had his trusty Bob trailer. Most of you would have heard, if you were at the race, that Al actually rode TO the event as well. 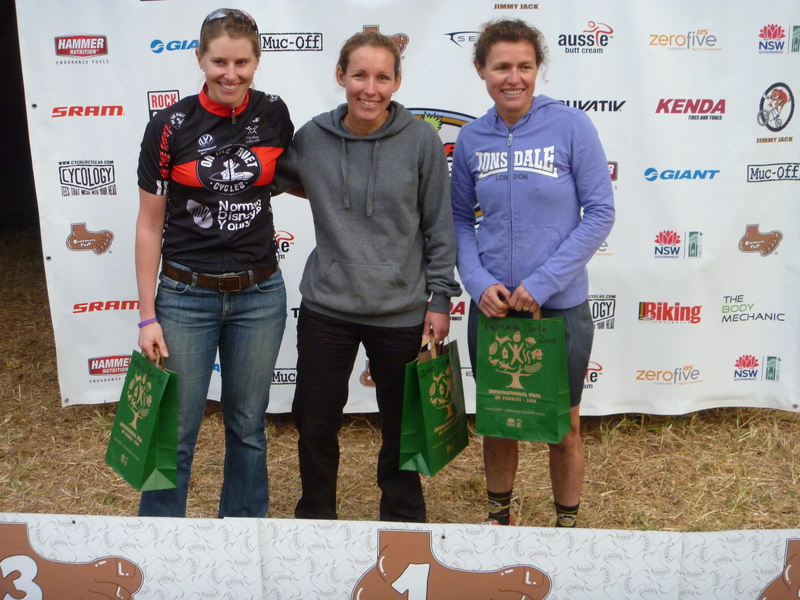 Enduring freezing snowy conditions on Friday, partial hypothermia, sleeping under a road bridge and lugging Bob all the way to Nowra, only to race the 7 hours as a solo and do a very respectable 13 laps! 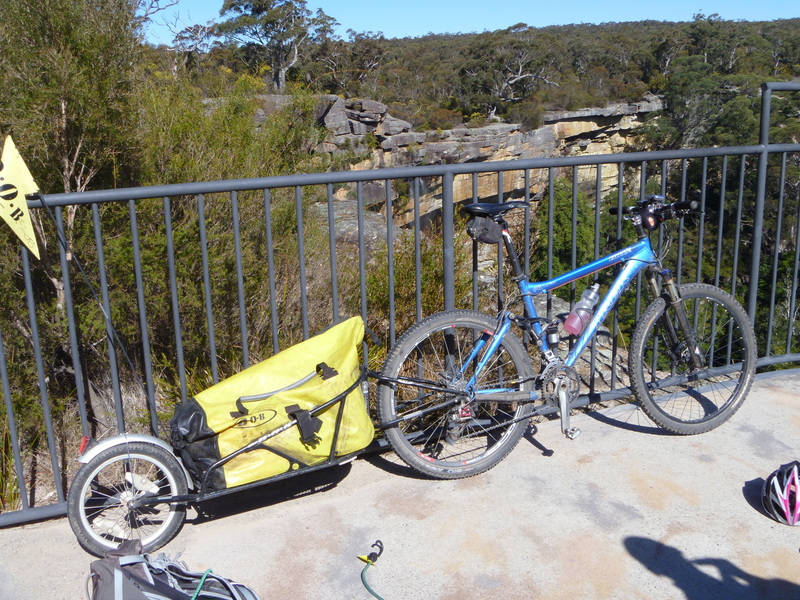 This is Al’s rig at the falls lookout near Sassafras. Quite a pleasant ride with the temperatures soaring to knicks and jersey weather. From the top, looking back you can see all the way back to the coast to Point Perpendicular, very speccy. 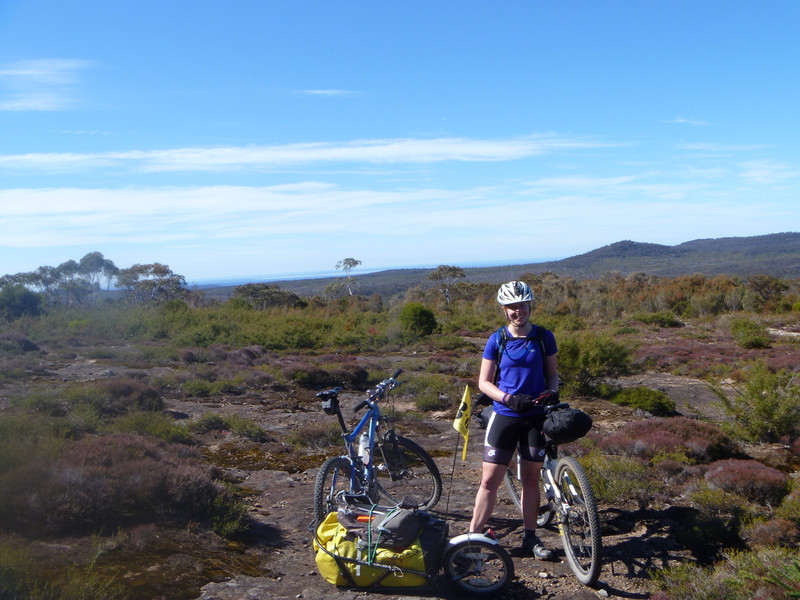 Next we descended down into the Budawangs for a great loop with lovely views and varied riding from rocky, open sandy terrain to wooded, grassy rainforest areas. Some cool rock formations there too. Things were going smoothly, it was perfect weather and we were making better time than expected. Al was pretty gung-ho with Bob attached though. Numerous times we were careering down rocky stuff and I took a second to glance up only to see Bob completely airborne. 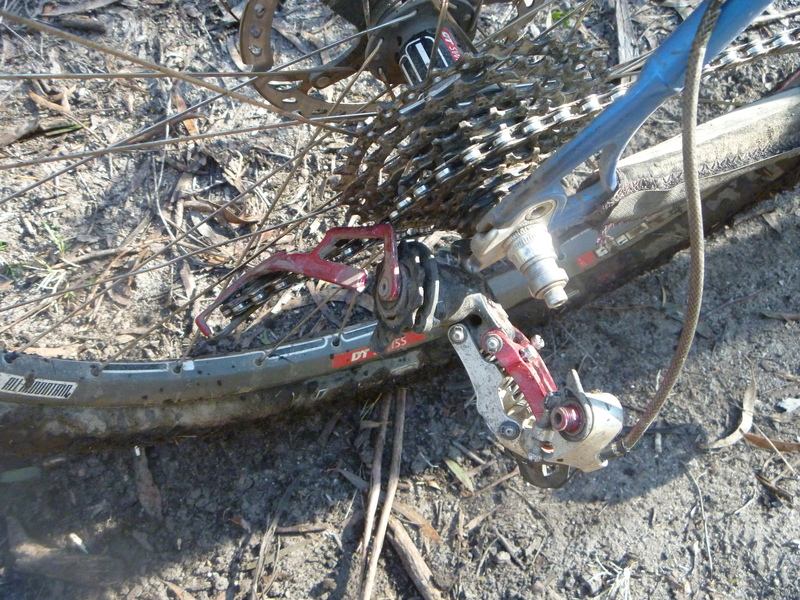 My comment about the dangerous number of sticks for derailleurs was answered by Al’s comment “Just go so fast that the sticks don’t have a chance to get stuck!”….. Needless to say, I wasn’t surprised when I turned a corner to find Al with a lovely new XO carbon derailleur which was completely mangled to shreds into his spokes by a stick, plus 2 broken spokes and a few others looking fragile. OUCH – no words needed. Now I might be a girl, but I am an engineer, and I came up with a great solution on where Al’s newly laid to rest derailleur could live for the time being, the seat bag! Newly single speed Al with rear D in the seat bag. 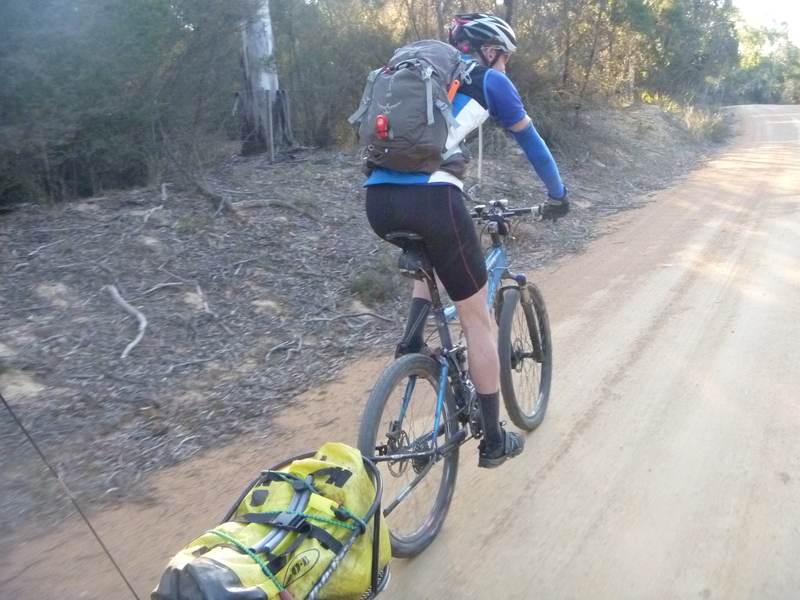 Quite quickly we converted him to single-speed and limped out of the Budawangs at a very slow pace to Nerriga. After some chips and an interesting conversation with seedy locals at the pub, we decided to bail on our Wog Wog route in case Al’s wheel decided to completely fail. Oallen Ford was too far to reach with only a few hours of batteries between us, so we camped out like squatters in a deserted cottage on the edge of town. 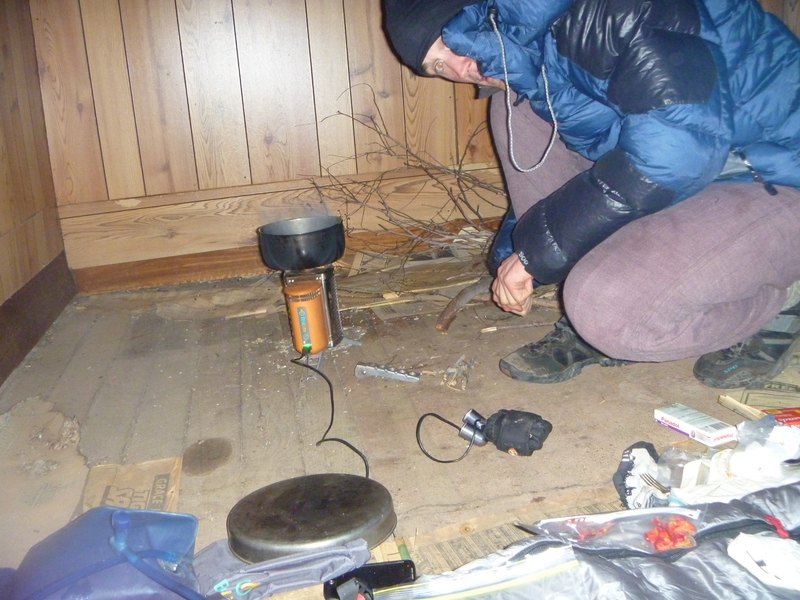 Freezing and trying to be a bit more stealthy, we lit the stove inside, ate dinner and went to bed about 8pm. I would have to say that even though we were under cover, it was the coldest night I have ever spent trying to ‘sleep’ in my life. With my summer sleeping bag (rookie mistake), skins, tights, silk sleeping bag liner and bivy I was still visibly shivering. I used Al’s emergency blanket to wrap myself up like a big bag of crinkly chips, but still spent the night with freezing and painful legs and feet. Was also very worried about locals finding us in the cottage and shooting us with their big guns that they were talking about at the pub the day before, so not really any sleep this night either. On Tuesday, our newly adopted route home favoured ease of rescue by car and meant we would go Tarago, Bungendore and home via the good old Federal Highway. 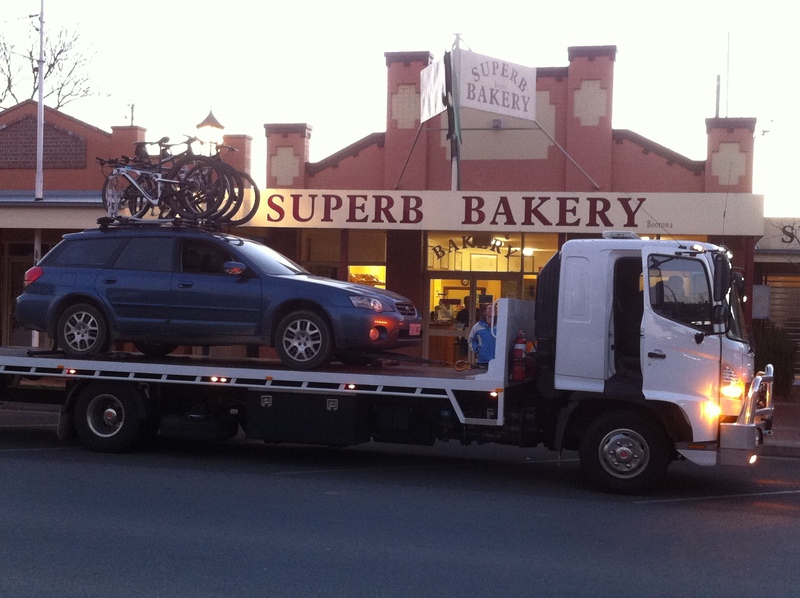 Our road bash back to Canberra was quite uneventful. We didn’t really have a proper breakfast that morning, as the bogan residents of Nerriga were waking and we wanted to get outta there! 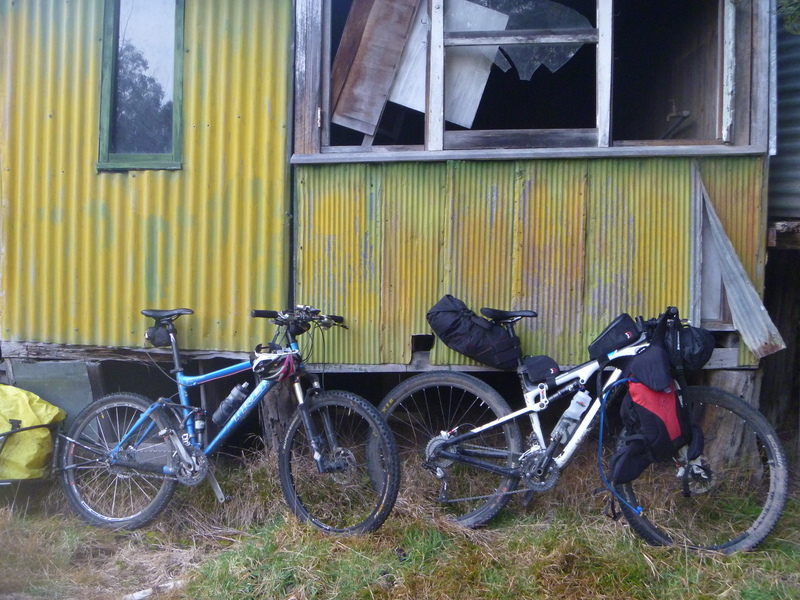 So when we got to Tarago we both had two chicken and leek pies, a coke, packet of chips and shared a pizza. 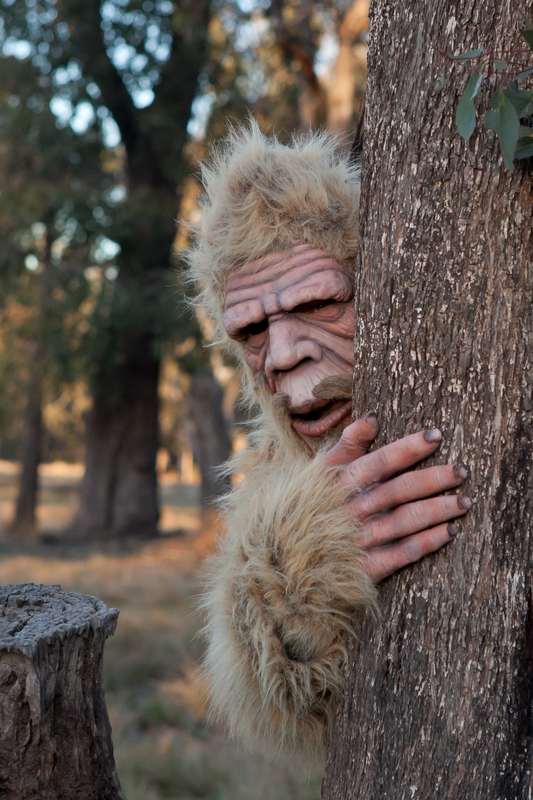 Poor Al didn’t have much luck finding vegetarian food and had to adopt a ‘flexetarian’ outlook on eating for a bit. I sat on the front into a driving headwind for a good 100km, while we nursed poor Al back home. His gears spun out at 18km/hr but he was more comfortable riding at about 14km/hr. This suited me because the headwind was crazy coming back into Bungendore. 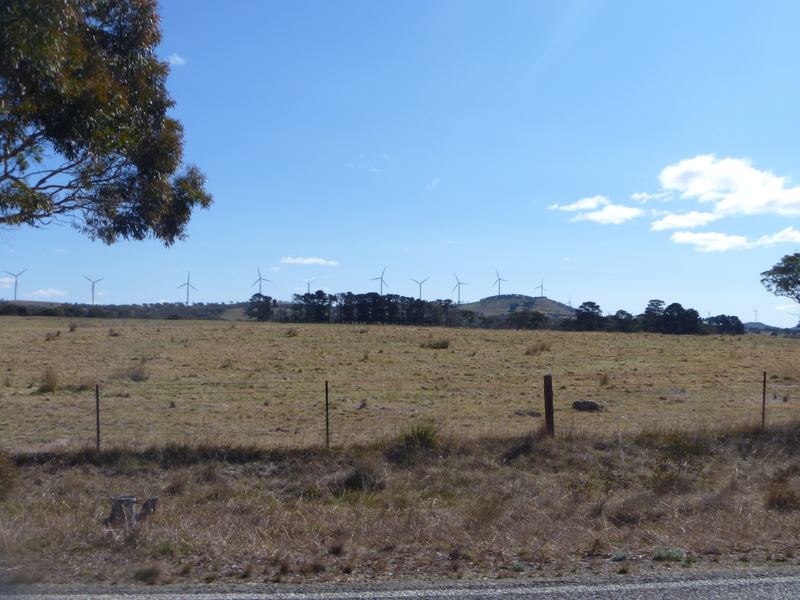 The Bungendore wind farm from a direction I had never seen it. I fully appreciate why there is a wind farm here now. We made it home to Canberra in quite a respectable time. Al was off to the bike shop to hand over what would be a very expensive fix-er-uppera, after clocking up over 500km over 5 days. BIGGEST KUDOS AL! I headed home to complete the last part of my post race routine: eat so much bad food that your stomach hurts, shower (for the first time since Saturday) and sleep well in a comfy warm bed. At least Al and I have similar outlooks on adversity, as we had such an awesome time laughing at the situation, crawling along in the wind, mooing at cows 🙂 Best two days leave I have ever used. Thanks to Al for the idea and the company and to Seb, Ria and Pete for taking all my stinky unwanted race stuff home! 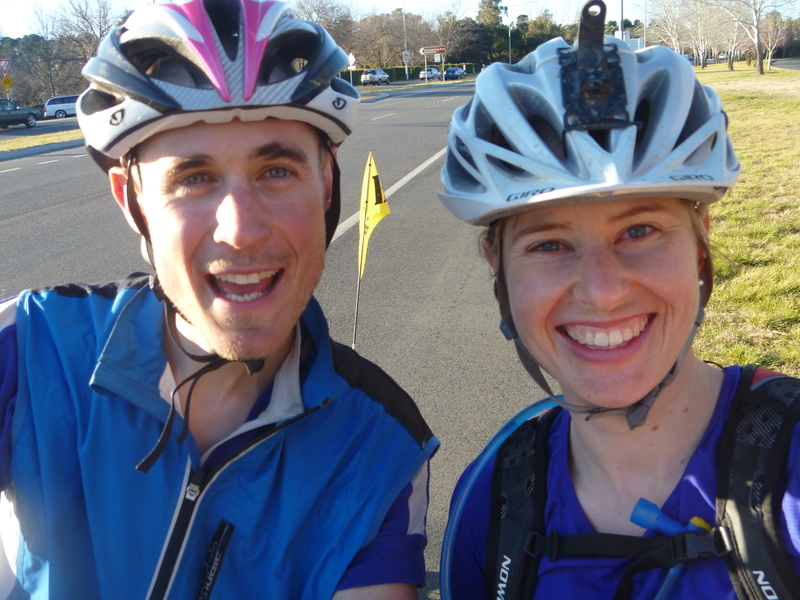 The dirty adventurers back in Canberra! 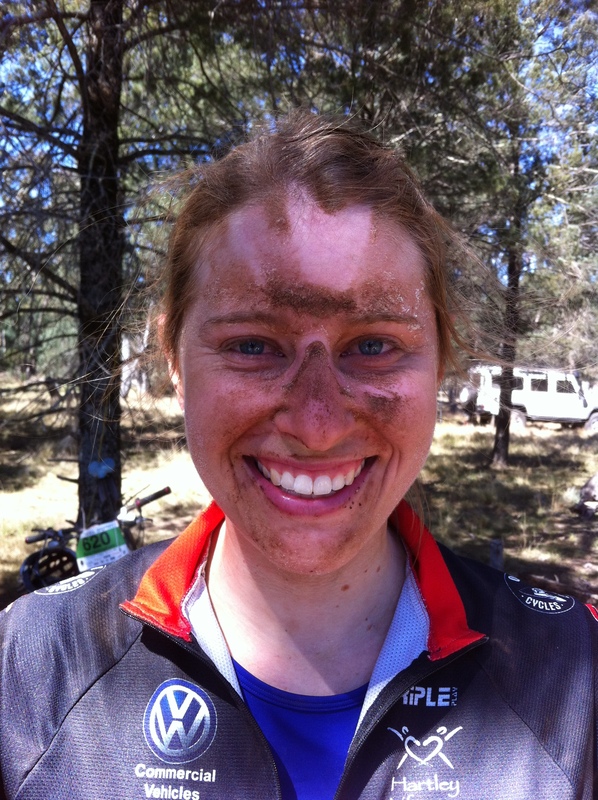 This entry was posted in BikingBethany and tagged bikepacking, Chocolate Foot Singletrack Mind, epic rides, races on August 22, 2012 by bethany. 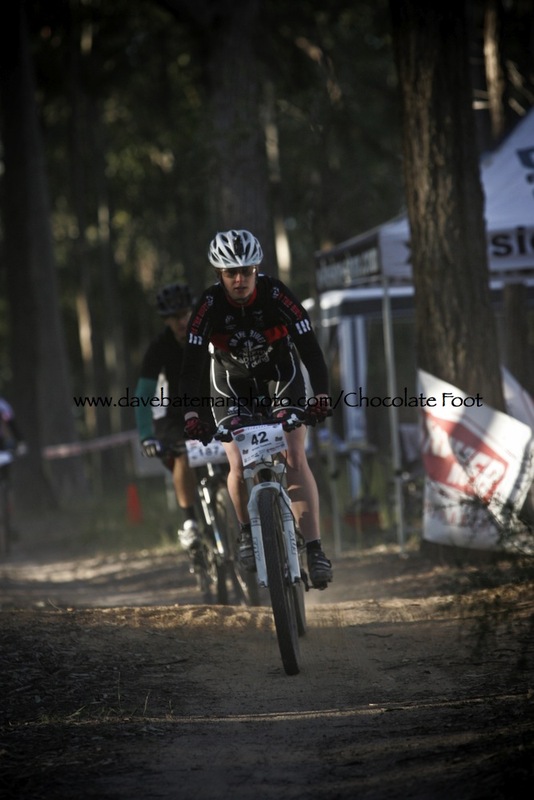 Race two of the Chocolate Foot Singletrack Mind series was held on Sunday at East Kowen Forest in Canberra. Let’s just say that after a hectic day of housewarming celebrations the day before, we really appreciated being able to drive to and from the event in one day. That morning I didn’t feel envious of the team riders at all. It was -2 degrees and they were shivering away on the start line in minimalist lycra, ready for a lap of extreme exertion before donning a puff jacket and collapsing into a chair to await the return of their team mates. I, however, in multiple layers, buff and winter gloves, was ready to churn out the 7 hours in cosy warmness (so I thought). That is what I look forward to the most from solo racing, none of this stop start business! I had started a fair way back in the pack and had no idea who was in front of or behind me. I rolled around lap after lap and things were going smoothly. I was feeling great and nothing exciting really happened except the odd high five to Gumby mid-track and yelps every lap as I found myself crossing that bridge log-roll-over without meaning to! It was a tough course for me as it would soon be revealed that compared to most other riders on course, my downhill finesse probably resembles a wobbly ice-skating elephant. I guess that explains the reason for the looks of horror in most of the photos from the day. Not to worry, the Superfly is a demon uphill and I couldn’t get enough of it! The bike now has a complete new rear end after a few issues with cracks. Once again I have to thank On the Rivet Cycles, a complete once-over of the newly fixed bike dislodged buckets of Stromlo dust from the Scott last October, Tasmanian sand from Wildside and Majura gunk from Easter 24hr. Thanks guys, the bike was absolutely sensational! Towards the end of the race I did have the unfortunate experience of watching a rider in front go flying through the air, completely off the track and landing neatly on his head between the pine tree stumps. He was complaining of a very painful neck and tingly hands and that was enough warning signs for us to get the medics there ASAP. I hung around until there were enough experienced people to deal with the situation and an ambulance was on the way. Leaving the poor fella wrapped up in my long sleeve winter jersey, I tried desperately to warm up from the freezingness, totally unprepared for riding in just a sweat-sodden short sleeve jersey! Not knowing where this left me in terms of race timing I just kept pedalling. Finishing with big smiles I was absolutely stoked to hear that I came third, just over a minute behind second. After a final high five to Gumby and assurance that the injured guy was going to be ok, we headed home to pizzas and 12 hours sleep, utterly exhausted but happy to have experienced some good karma at Kowen! It was great to see Connie from Hammer Nutrition down from Qld: she braved the cold and manned the Hammer Nutrition tent all day. 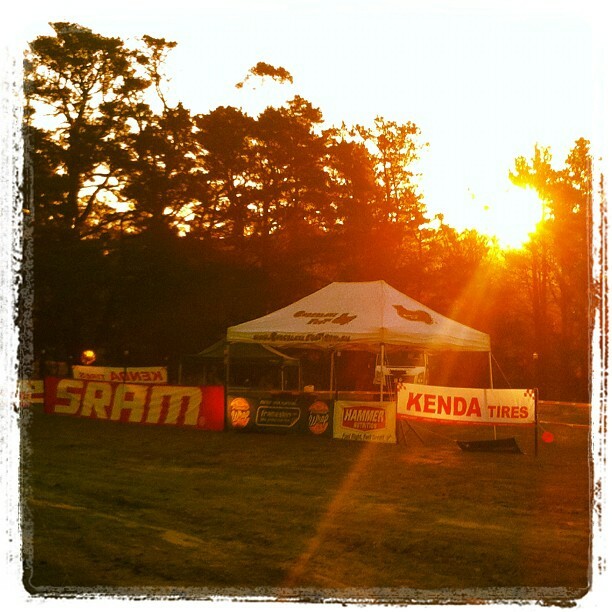 Also great to see so many people lining up for some proper enduro nutrition! I managed nearly a full spectrum of Hammer products throughout the race including Perpetuem, Hammer Bars, Hammer Gels and fizz Endurolytes. 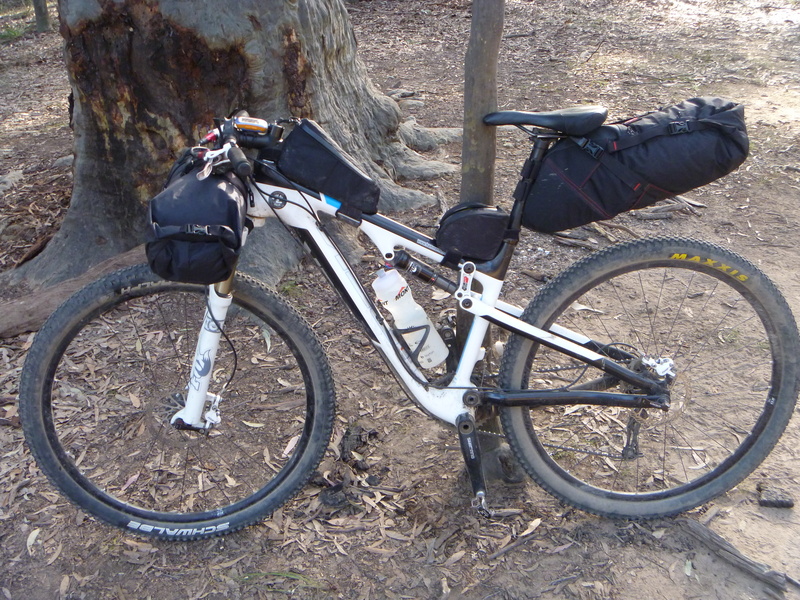 All restocked now (thanks Connie) and ready to tackle Nowra – here’s hoping it is warmer than -2 degrees!! 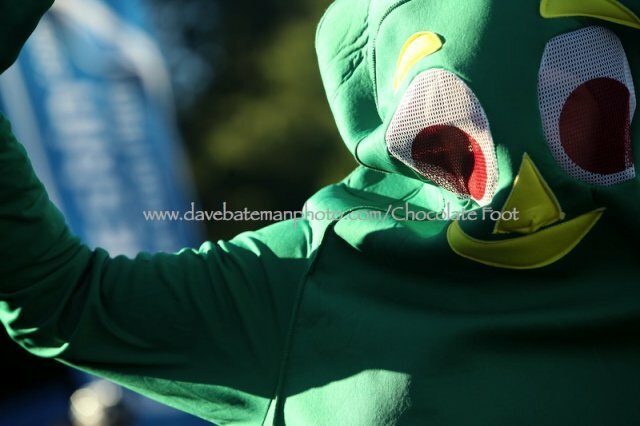 Thanks for an awesome race Chocolate Foot! 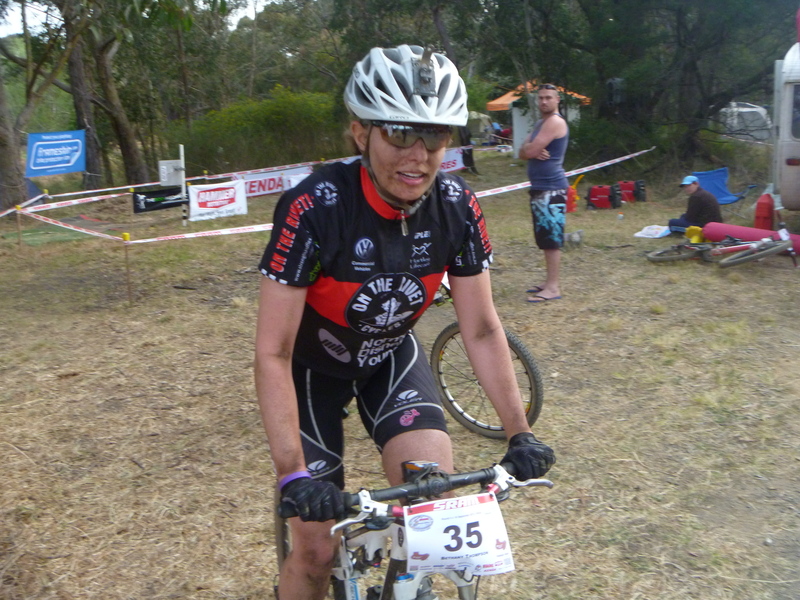 This entry was posted in BikingBethany and tagged Chocolate Foot Singletrack Mind, races on June 26, 2012 by bethany.